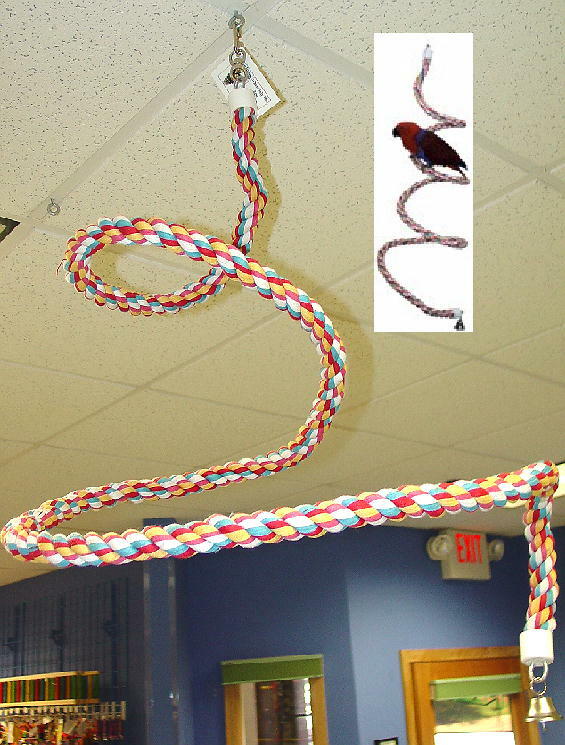 Please feel free to contact us for recomendations on which size and length Bungee is best suited to your companion bird. PLEASE NOTE: the above price is for one Small Bungee. You will need to choose which size you would like in the Available Options box above. If you would like the Medium, Large or Extra Large Bungee the Additional Price shown there will be ADDED to the price of the Small size. Small: 52" long and the rope is 1/2" in diameter. Medium: 66" long and the rope is 3/4" in diameter. Large: 96" long and the rope is 9/10" in diameter. Extra Large: 97" long and the rope is 1 1/4" in diameter. 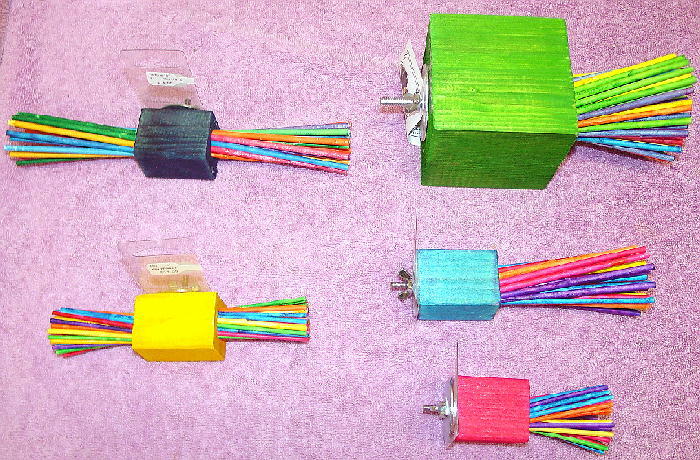 We recommend the Small Bungee for birds from Parrotlets, Parakeets and Cockatiels to Senegals and smaller Conures and similarly sized birds. 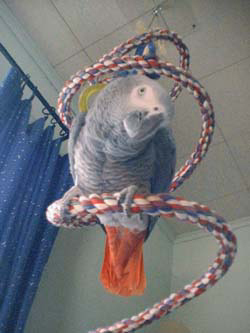 The Medium Bungee for birds from Cockatiels, Senegals, Conures and Pionus up to the smaller Amazons and similarly sized birds. 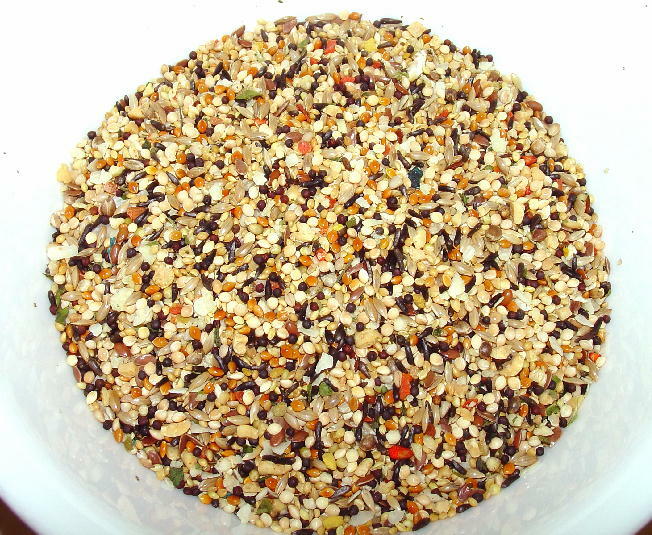 The Large Bungee for birds from Senegals, Caiques and Pionus up to Amazons and African Grey, Eclectus and similarly sized birds. 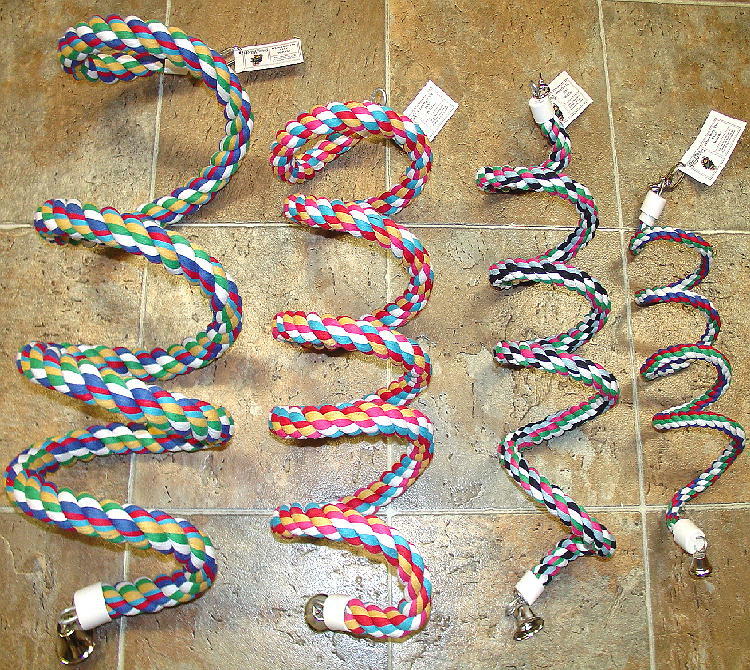 The XL Bungee for birds from Amazons, African Greys and Eclectus up to the largest of Cockatoos and Macaws. These are a formable rope perch made of specially woven cotton blend that will soothe and exercise tender feet, while preventing the foot sores and raw spots that can develop when only dowels or hardwood natural perches are being used. 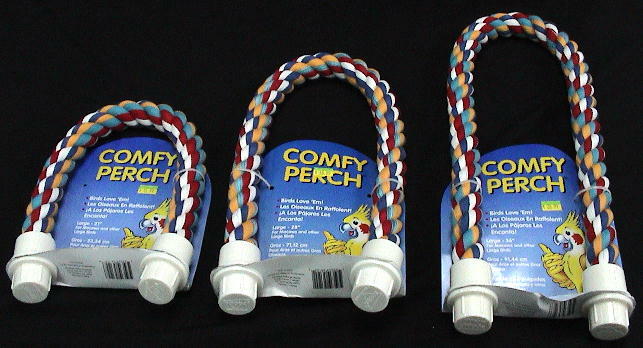 Your bird(s) will love the shape and feel of the Bungee Perch/Swings. 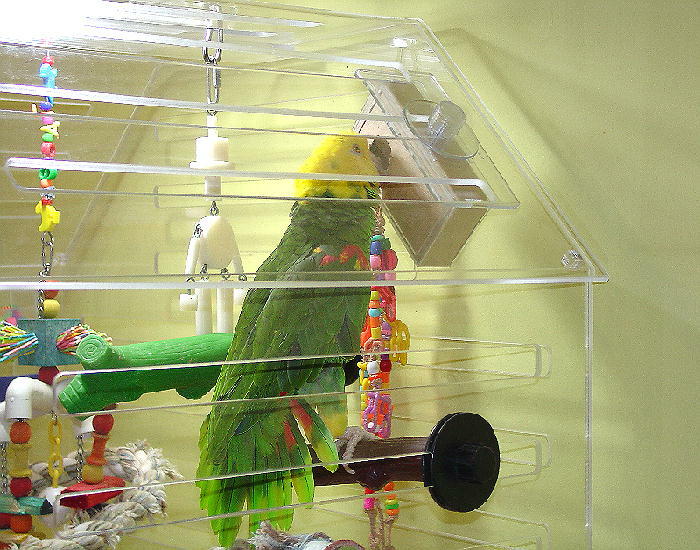 We most highly recommend cotton rope as the primary in-cage perch material to provide the different perching surfaces and levels birds need in their environment. Your bird will enjoy it when you create loops, curves and other interesting shapes for them to explore. These perches install in minutes, and hold shape their shape indefinitely because of the steel rod used. 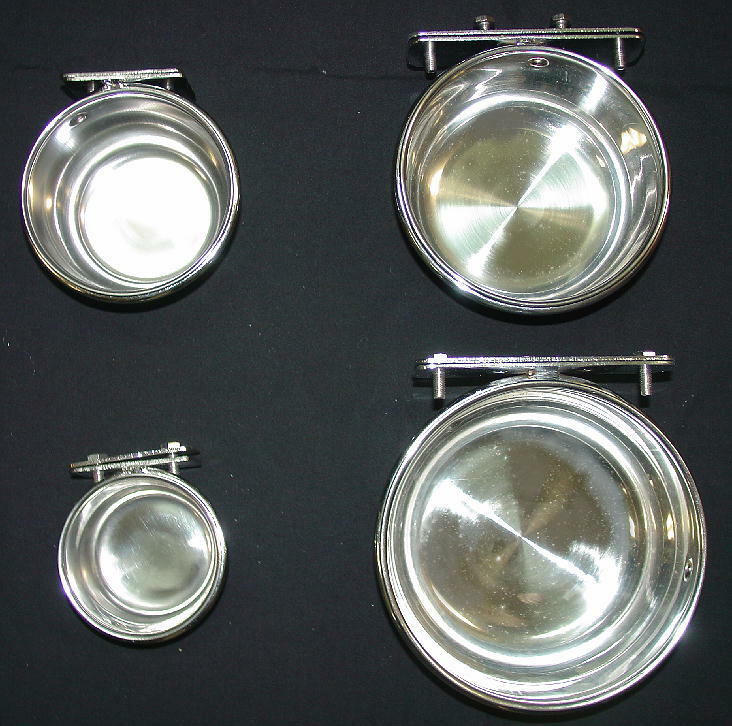 For use in either our Acrylic Cages or any standard metal cage. We recommend washing them every 10 to 14 days in the clothes washing machine (along with a few towels) and then hanging them up to dry. We recommend NOT placing them in the clothes dryer as the heat and tumbling will prematurely wear out your perch. Some of our customers recommend placing them in the upper rack of the dishwasher, setting it on a low heat cycle and then removing them before the dry cycle begins. At Parrot Island we use these Bungees to add on to our Manzanita Play Trees, to the PVC Hanging Gyms as well as hanging them from the ceiling (we use the PVC Ceiling Guards with them) in a gradually wider opening corkscrew for our birds to bounce up and down on (where the name "Bungee" originated from). Click here to see the entire assortment of Perches, Stands, Bungees and Swings we offer!